USDA Home Loan: Is This Your Right Mortgage Choice? 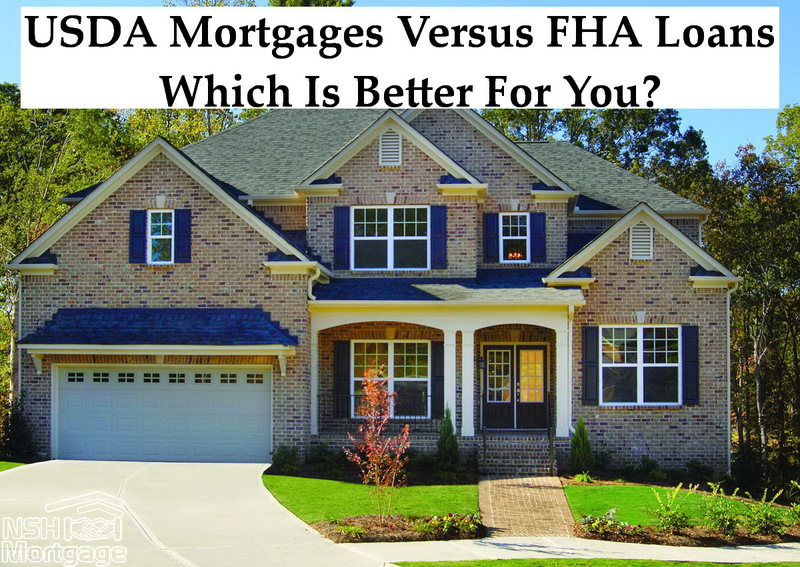 USDA Mortgages versus FHA which is better. NSH Mortgage has the wisdom and tools to help you with the financial benefits USDA Mortgage loans provides you. You decided finally to buy your first home so you must consider all that goes into this decision in finding your ideal home. You want to find the ideal home in a good neighborhood. It should fit your budget and possess the right amenities. Once you have found the property, you have another important decision to make how you will finance it. Today’s market offers several programs that makes buying your very first home much easier and there is no right loan choice for everyone. The correct loan is the one that suits your situation the best. Two extremely popular options amongst homebuyers are the USDA Rural Development loan and the FHA home loan. They are both low down payment loans, but beyond that, they are very different. You might be surprised at which one is the right choice for you. What if you could get a no down payment loan with comparable mortgage rates to FHA? And, what if that loan allows you to finance closing costs, even without ultra high credit scores? Is such a loan too good to be true? The loan actually does exist, and it is called the U.S. Department of Agriculture (USDA) Rural Development home loan. It is rising in popularity among first time home buyers. A USDA home loan is different from a traditional mortgage in several ways. But that does not make them inaccessible. In fact, some features of USDA make them more attainable compared to FHA. USDA loans require no down payment and you may finance up to 100% of the property value, which, sometimes, is above the home’s purchase price. In these cases, the buyer can finance closing costs. Here is how it works, you make an offer on a home for $200,000. The lender’s official appraisal report states the home is worth $205,000. The buyer can open a loan for the full value and since the excess funds are applied to the closing costs such as the title report and loan origination fees. Excess funds can even be used to prepay property taxes and homeowner’s insurance. So, in the end, the buyer pays even less than no down payment. Home buyers typically pay something out of pocket, even if they put nothing down. Closing costs can add thousands of dollars to the necessary cash to close figure. Even most renters must put up a security deposit, plus a few months rent. But with USDA, there is a chance the buyer can walk into a home paying nothing from their own bank account. With FHA, the homebuyer must come up with a 3.5 percent down payment, plus closing costs. FHA has no guideline stating that the loan amount can exceed the purchase price. The only way to get a zero out of pocket loan with FHA is to get a down payment gift, plus additional gift funds or seller contributions for closing costs. USDA is more flexible, so buyers with little cash on hand should look into this option first. USDA eligibility depends on the location of the home. You must purchase a property in a rural area as defined by the USDA. Based on U.S. census information from more than 15 years ago. So, many solidly suburban areas are still eligible. USDA publishes online maps with which buyers can check the eligibility of a certain address or geographical area. Buyers will find that some entire states are USDA eligible. Even highly populated states contain surprisingly vast USDA eligible areas. An estimated 97% of the American landscape is geographically eligible for a USDA loan. Still, some buyers might find that eligible areas are too far outside employment centers, and therefore choose a FHA loan, which comes with no geographical restrictions. The Rural Development loan was created to spur homeownership in rural areas, especially among home buyers who would not otherwise qualify. As such, USDA publishes income limits. Maximums are set at 115% of the median income for the county or area. That amounts to adequately non restrictive limits and the following are some examples of maximum annual incomes in various locales around the country. Not everyone will fall within USDA income limits. That is where FHA comes in the FHA loans comes with absolutely no income limits for its standard program. You do not have to be a first time home buyer for either FHA or USDA. However, for both loan types, you cannot own adequate housing within a reasonable distance of the home being purchased. For instance, if you own a three bedroom house, you cannot use FHA or USDA to buy another three bedroom house down the street. You must also plan to live in the home you buy. Rental and investment housing is not allowed under USDA or FHA. Both loans have the same goal: get individuals and families into their own homes. Neither loan permits activity that could be interpreted as a real estate investor building a portfolio. Similar to the Federal Housing Administration’s FHA mortgage, the USDA uses homeowner paid mortgage insurance premiums to keep the USDA home loan program viable for future home buyers. But USDA mortgage insurance premiums are cheaper than those of FHA, and have recently dropped even further. Beginning in October 1, 2016 USDA reduced its mortgage insurance premiums. The upfront mortgage insurance, which is financed onto your loan balance, dropped from 2.75% to one percent. Likewise, the monthly premium fell 15 basis points (0.15%) to just 0.35%. Compare USDA mortgage insurance to that of FHA and you will immediately see the significant savings. The FHA upfront mortgage insurance premium is 1.75 percent and the monthly fee is typically 0.85 percent of the loan balance, divided equally into 12 installments and included with each mortgage payment. The following table compares the upfront fees and monthly costs on a $250,000 mortgage loan after October 1, 2016. The mortgage insurance savings alone could be enough to push some FHA buyers to USDA, if the zero down payment feature was not reason enough. There is no stated maximum loan size for the USDA loan programs. The amount you can borrow is limited by your household’s debt to income (DTI) ratio, the comparison between your monthly debt payments and gross income. Essentially, a homeowner who makes $6,000 per month and $2,000 in monthly debt payments has a DTI of 33%. Usually, home buyers that qualify for a USDA rural home loan should go in that direction. With comparable rates, lower mortgage insurance premiums and the opportunity for a 100 percent financing. USDA Rural Development loans make sense for many of today’s suburban home buyer.